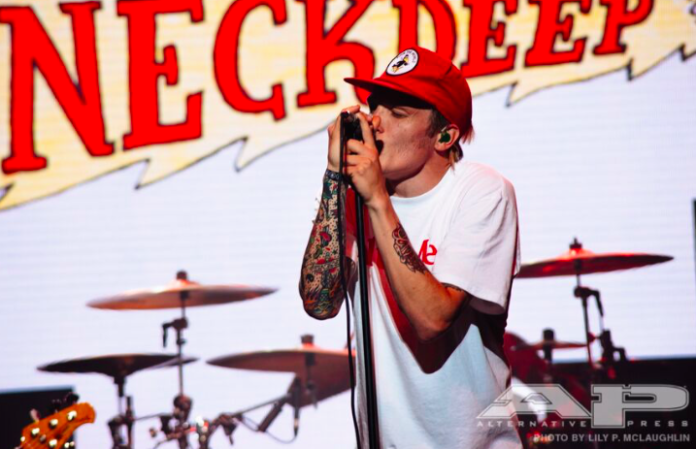 Neck Deep frontman Ben Barlow will not be performing with his band for the rest of their current tour due to his father's passing. The band will continue the remaining dates on the tour, however—friends and crew will fill in for Barlow. Read a full statement from the band and see tweets in support of Barlow below. As some of you have may already heard, Ben has had to leave tour and head home immediately to be home with his Family after the distressing news of his Father, Terry Barlow's passing. From all us at the ND UNIT, we send our deepest condolences and all of our love to the Barlow family in this difficult time. We, at the ND UNIT had the difficult decision of whether or not to cancel the last few shows of this tour, or carry on with our crew members and some guests to finish it off in honour of Ben and his Dad, Terry. We've chosen the latter! We WILL be playing the remaining dates of the Made To Destroy tour with Pierce The Veil with our friends and crew filling in for Ben whilst he can't be here. Along with this, we'll be doing a special run of the Terry Barlow Records tees and we will donate 100% of the profits to charity, but we'll have more details on this in the coming weeks. We appreciate all of the kind words and support you have for Ben and the rest of the Barlow family in this time and would love for those of you coming to the next few shows to come and sing as loudly as you can to help us through. Details on the special run of Terry Barlow Records shirts are to come. See the remaining dates of Pierce The Veil's “Made To Destroy” tour with Neck Deep and I Prevail below the tweets. AP expresses it's deepest condolences to the Barlow family.